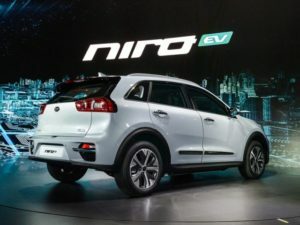 Kia’s forthcoming electric Niro SUV will offer a range of up to 280 miles when it launches in the UK next year, according to details released at the Busan International Motor Show in Korea. The Kia Niro EV is likely to launch in Europe next year. The Niro EV launches alongside hybrid and plug-in hybrid versions in its home market later this year. In Europe, where 28,000 Niros were sold in 2017, the SUV will arrive slightly later – likely in 2019. Drivetrains appear to be shared with the Hyundai Kona EV; Kia will offer a choice of long-range 64kWh and 39.2kWh batteries, with ranges of 450km or 300km respectively, and has confirmed a 204hp electric motor. As the Niro EV can be charged at up to 100kW – twice the speed of today’s rapid chargers – it takes around 54 minutes to recover 80% of that range. It’s unclear whether, as in the Kona EV, the smaller battery will also get a lower-powered motor. Inside, the dashboard has been redesigned around a rotary gear selector, and now features a wireless phone charger and a light near the windscreen showing charging status. Boot capacity is larger than the hybrid versions, and the Niro EV features a unique infotainment display with details about electric vehicle-specific data. Expect European pricing to follow later this year, likely close to its regional debut which can be expected at the Paris Motor Show in October.